On December 1st 2016 W Bro David Evans completed his year as Worshipful Master of Athelstan Lodge. During his year, ably abetted by his wife Karen and with the support of the Brethren and their partners, he raised the magnificent sum of £6,241.00 for Charity. A Burns night, Sunday Lunch, Week-end away, Garden Party and culminating with his Ladies Festival, all helped to raise the money. The lucky recipients were The Mary Ann Evans Hospice and the St Giles Hospice, the nearest Hospices to Atherstone, they received £3120.50 each. 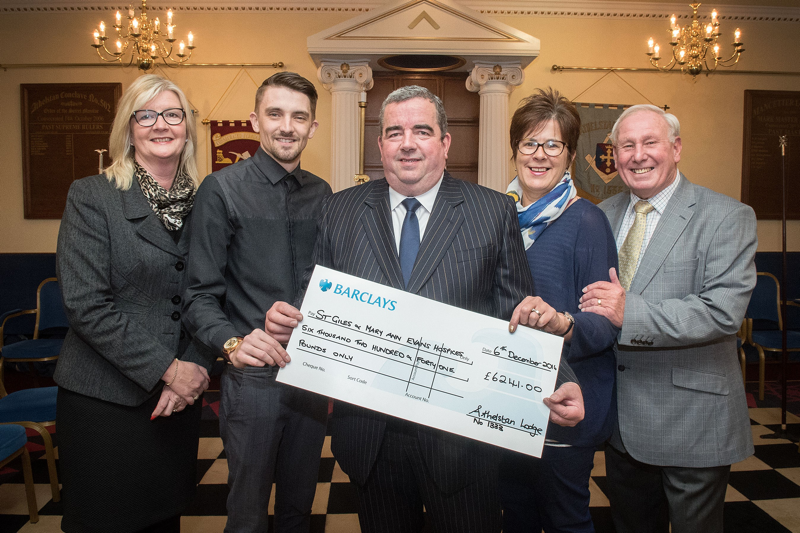 The cheques were presented at Athelstan Lodge Rooms to a delighted Janet Kavamagh, Mary Ann Evans Hospice and Mr Richard Phillips, St Giles Hospice who thanked both W Bro David and all the Members of Athelstan Lodge for the generosity.